A van driver has been convicted of causing serious injury to a cyclist on the A22 by driving carelessly earlier this year. Hailsham cyclist Aaron Jones had to quit his job after the collision left him with severe injuries and memory problems. Krasimir Ginov, 48, from Bulgaria, was convicted of causing serious injury by careless driving at Lewes Crown Court this afternoon. He had pleaded guilty to driving without insurance. Making his case yesterday, prosecutor Richard Barton said Ginov ‘simply failed to see’ Aaron Jones before his van struck him. After being sent out to consider their verdict this morning, the jury returned this afternoon. Ginov, who lives in Gillingham in Kent, was convicted of causing serious injury by careless driving. 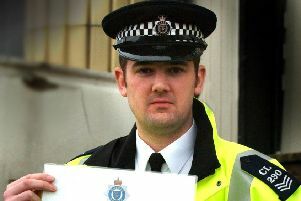 He was fined £500 for the careless driving and £600 for the insurance offence. He must also pay a Victim Surcharge of £110. Ginov was also disqualified from driving for 18 months.